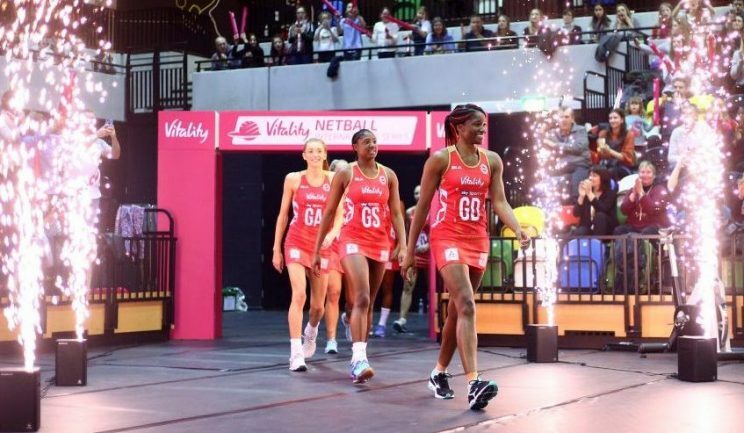 The third and final game of the Vitality Netball International Series between England and Uganda was another dramatic affair, but the Vitality Roses proved too strong for the She Cranes once again and sealed a 66-37 win. England fans turned out in droves to support the Roses, who defeated the She Cranes in the first two games of the series meaning they sealed their place as champions before hitting the court at the Copper Box Arena for the final game. Winning all three games was the perfect homecoming for the Roses, who played on home soil for the first time since the Commonwealth Games in the first match of this high-octane series on 27 November. England’s captain, Serena Guthrie, once again took the first centre pass of the final game and Rachel Dunn opened up the scoring. After the Roses took a 3-0 lead in the first two minutes, a missed opportunity from Helen Housby and Dunn saw the She Cranes gain possession of the ball and work it down the court for another perfectly executed goal from Uganda’s captain, Peace Proscovia. The tempo continued to speed up and the Roses stretched their lead even further. The score in the first quarter was left at 20-8 to the Roses. Guthrie took the first centre pass at the start of the second quarter and excellent teamwork between Guthrie, Sasha Corbin and Dunn meant the Roses secured the first goal of the quarter. The She Cranes piled on the pressure and Proscovia was able to add several more goals to her tally halfway through the second quarter. Housby pounced on a loose ball and gained possession for the Roses who then went on the attack again. Whilst the She Cranes put up a strong fight in the first half, the Roses commanded control once again. The score at half time was 31-20 to the Roses. At the start of the second half, Head Coach, Tracey Neville, brought on Natalie Haythornthwaite as GA with Housby coming off. The Roses secured yet another goal but the She Cranes responded in kind with a goal by Proscovia. Great defensive pressure from Francesca Williams meant the Roses gained possession, which was followed by an excellent move between Guthrie, Haythornthwaite and Dunn meaning the Roses continued to grow their lead. George Fisher was brought on towards the end of the third quarter as Dunn came off. The third quarter came to an end with the Roses leading 46-29. Further changes for the Roses meant that Jade Clarke moved to C and Gabriella Marshall came on as WD at the start of the fourth quarter. The She Cranes got things up and running by taking first centre pass and further increasing their score. Neville made additional changes during the final quarter, bringing Razia Quashie on as GK with Usoro-Brown coming off. Top work from Fisher and Haythornthwaite meant both shooters continued to be on target and raised England’s score substantially during the last quarter. It was another tough game for both sides but the Roses showed exceptional persistence throughout and ended the series on a high with a 66-37 win. The Vitality Roses will be back in action in January 2019 when they face Australia, New Zealand and South Africa in the Vitality Netball International Series, as part of the Netball Quad Series!